Do you like to unwind by taking a bath every once in awhile? Doing so can be the ultimate in relaxation. If your current facilities are a little lacking in the tub department, you might want to consider a few changes so that your next bubble bath is a real treat. You might be surprised how many different luxurious bathtub styles are out there. Instead of going with a typical tub, you might try something a little different. If you want to up the level of luxury in your bathroom, you could invest in a whirlpool bath. Put some bath bubbles in the water and the fixture will fill with delightful foam instantly. Choose a tub with deeper sides. When you step in, you'll get a feeling of security from the walls surrounding you. When deciding, be sure that the bathtub's sides slope gradually enough that you can comfortably lie back in it. For a deeper fixture, you could invest in a walk-in tub. You enter this bath by opening a door on its side. These fixtures are even available with air massage and whirlpool features for further extravagance. Do you want to add some flair to your bathroom? You might try a tub that isn't so traditional looking. Freshome Design & Architecture shows you how to find bathtubs that are truly one-of-a-kind. These modern tubs are totally minimalist. The black, egg shaped bath seems to suspend in the air, installed in a base about half a foot above the floor. The fixture may be compact, but it is sleek and comfortable. Instead of just staring at a tiled wall while sitting in the bath, why not let yourself look at something more pleasing to the eye? A CNN Travel report notes that the bathtub in Prague's One Room Hotel at Tower Park Praha has a view out of its east-facing windows over the exquisite city. If possible, you might want to provide a view for your bathtub similarly. 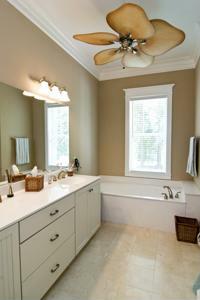 If you extend the window space in your bathroom, you might be able to admire outdoor scenery while you soak. Otherwise, you can at least put some lovely artwork at eye-level. If renovating your bathroom, treat yourself by choosing a comfortable bath fixture and giving it a view for when you're in it.